The goal of the task is to trace the shape of a person when they perform a veriety of actions. In the first frame, the puppet already matches the person, just click the right green arrow to proceed to the next frame, or click the left green arrow to go back to the previous frame. 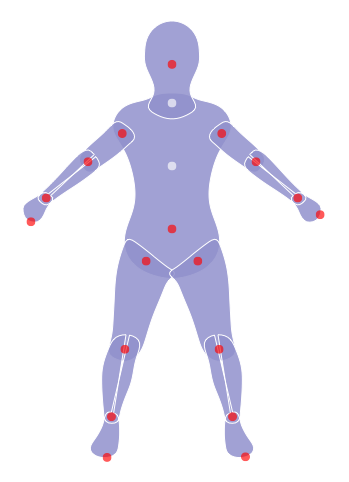 For each sebsequent frame, (1) drag the green dot at the torso center to the center of the person (2) drag joints of the puppet( white dots ) until they match those of the person (3) drag the belly (yellow dot ) to align the contours. At the end, when the "Done Annotation" button appears, press it to submit the HIT. 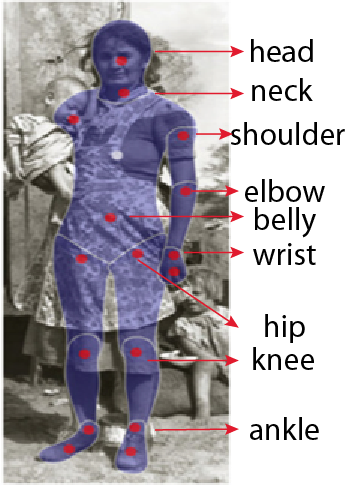 * The correspondence btween body joints and puppet dots are shown on the left. 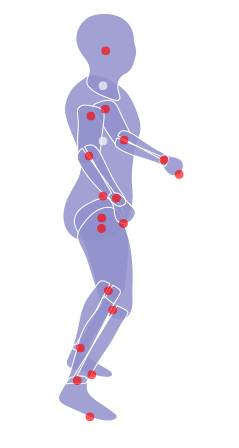 * Note that the dots on the hands and feet are not adjustable. * Copy from the previous puppet? Copy it! * Some joints are invisible? make a guess!